The Starline Monoblock range of Swimming pools - a top class swimming pool manufactured in the Netherlands, based upon over 35 years of experience and development. 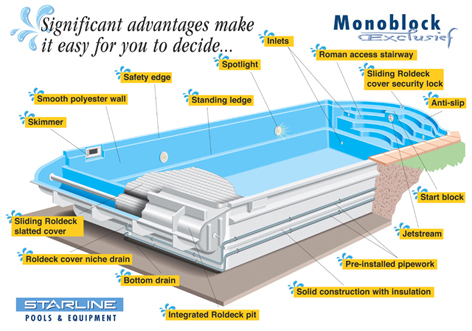 The Starline Monoblock is made from high-quality Vinylester, reinforced with a fibreglass sandwich construction providing an especially strong, stable and durable structure and also providing excellent insulation properties, which can help considerably in reducing your swimming pool running costs for years to come. Every Monoblock in the range has built in safety in mind and has features such as the lower standing ledge as well as a safety ledge which can act as a guide for the optional automatic Roldeck slatted cover. The Starline Monoblock is fully prepared to include this Roldeck cover which is hidden in a special Roldeck pit under the pool surround. The Roldeck is stored out of sight and the space surrounding the Monoblock is unobstructed, especially when an optional special child-safety lock is installed. Every Monoblock is supplied with factory fitted and tested pool shell fittings, ready for pipe-work and filtration connection. All the pre-installed fittings, pipe work and optional extras such as counter current swim units are exclusively factory sealed, pressure tested and guaranteed before the pool arrives on site totally complete, fitted with or without a Roldeck cover, filter unit, coping stones and terrace tiles plus all other accessories such as a water lever switch. Installation therefore is far less messy and can be faster than a standard pool build.